The Beechwood Upholstered Side Chair RF-172W-U is constructed with solid European beechwood frames and joinery that is intended for high-traffic restaurants. For each of our side chairs, arm chairs, and bar chairs there is a wide variety of wood stains and upholstery options to select from, including COM (Customers Own Material). Our European Beech wood restaurant chairs feature contemporary frame designs and upholstery options, but with the added strength and durability of commercial-rated mortise and tenon joinery that creates ideal dining chairs for hospitality applications. 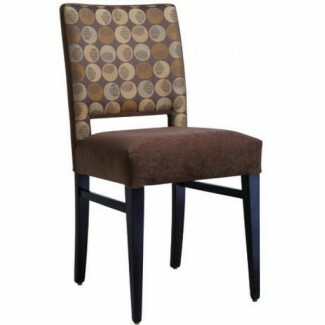 The Beechwood Upholstered Side Chair RF-172W-U will be ideal for all of your high traffic indoor restaurant needs. Wood Finish Options: Wenge. Upholstery Finish Options: There are a vast array of upholstery options. Please consult with one of our company representatives for more details.